Chorizo is hardly a British ingredient, but the Brits do love it like one of their own. The spicy, cured sausage is widely available throughout the UK in delis, as well as regular supermarkets, making it an easy-to-procure item for favored meals. If you are new to chorizo, it is a sausage that packs a lot of flavor. So much so, that you would be amazed to find it in a jam, as jams are associated with fruits and lots of sugar. But, surprisingly, this sweet and spicy chorizo jam really works! Though you may not be jumping out of bed to put it on your toast in the morning, this jam is delicious served with cheeses, pâtés, eggs and surprisingly with avocado. Try it, you ​will be pleased you did! Heat a large frying pan on the stovetop to hot, but not burning. Add the roughly chopped chorizo and fry until the sausage starts to crisp ever so slightly and releases some of the peppery, red oil, about 3 to 5 minutes. Watch over carefully to make sure the chorizo does not burn. Carefully remove the chorizo from the pan and lay on kitchen paper to drain. Return the pan with the red oil back into the heat and add the onions, lower the heat and cook for 15 minutes stirring from time to time. You want the onions to soften and turn a light golden brown, but not to go crispy. Add the garlic and stir well, cook for a further five minutes. Add the brown sugar and stir in the onions and cook for a further five minutes for the sugar to melt. Finally add the chorizo, Port and the agave or light honey if using, and cook over a low heat for 30 minutes, until a jam-like consistency. If the mixture starts to dry out, add a little water to keep if jammy. Finally, tip the jam into a food processor and blitz to a rough paste-like consistency. Put the jam into two clean, sterilized jars and cover with a lid. Store in the refrigerator. 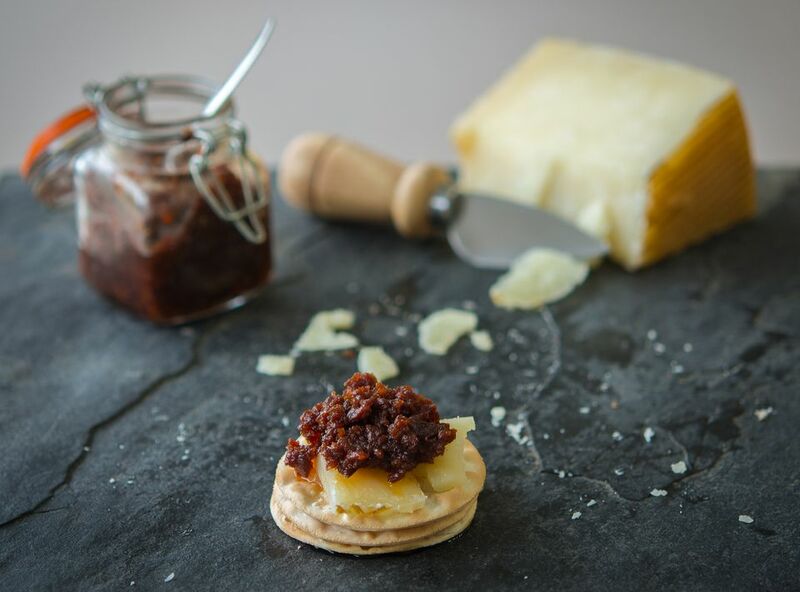 This sweet and spicy jam-like relish is perfect with cheese but really sings when served with a Spanish Manchego, they were made for each other. Otherwise, any cheese which packs a punch, such as an aged Cheddar, a Stilton, creamy Bries or blue cheese. A more unusual way to serve the jam is with eggs, especially scrambled. A plate of lightly scrambled eggs will leap to life with a spoon of this punchy jam. Chorizo jam has a special relationship with avocado. Mash the avocado, add a little cilantro (coriander) and then a teaspoon of chorizo jam, taste and add more to your taste.